Notes And Updates: With the implementation of "Just-In-Time" production and as a result of the re-calibration of the RV industry, inventory levels are matching production resulting in far less excess inventory. Thus, some RV Surplus businesses have gone out of business and others have begun selling new parts in addition to the limited amount of Surplus inventory they are able to acquire. Almost every month I receive a telephone call from someone looking for parts for his coach (often a Bounder) or sources of information on a particular problem that RVer is experiencing. The typical caller has recently acquired the coach and is trying to bring it back to its original pristine condition and the RVer is very interested in making improvements to enhance the RV experience. Many of the parts requested are available from the original coach manufacturer (i.e. Fleetwood) and I recommend calling the (Fleetwood) dealer first. They may have the part in stock or be able to order it. Of course, those parts will be new and carry a warranty. For older coaches, it may be worth a telephone call to Walt's RV in Fontana, CA, (909-823-0563), which started buying the end of model year parts and supplies from the Riverside, CA Fleetwood plant, where many models including the Bounder are produced. These parts were no longer needed; usually because of design changes or suppliers requiring minimum orders of components and all of them were not needed in production. Walt's has a large warehouse full of all sorts of parts and you can walk through the lot if you are in the area. Most of us will place a telephone call to find the required part. They will not refer to the part by Fleetwood part number so you will need to describe what it is that you require and they will advise as to whether they have it or not. These parts are new however there is no warranty, other than what might be still available from the manufacturer (on major components). There are various surplus dealers in the Elkhart, IN area where many of the suppliers to the industry are located. One that we visited that had a large selection of components is RV Surplus (http://www.rvsurplus.net/) These dealers sell a full range of major components; trim items, small parts that are common to many brands of coaches and brand specific parts. Prices are lower than a traditional dealer however, the selection of major components changes regularly. If you are traveling in the south Michigan or northern Indiana, it is worth going to these outlets, if for no other reason than to see what they have. There are various RV museums and tourist attractions, which make a week in the area worthwhile for the whole family. Several wrecking yards around the country sell salvage parts. If you do a search on the internet, you may find one close to you. Sources of information on common RV components are very wide spread. 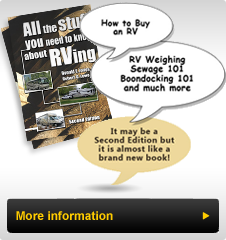 Of course, I recommend checking out the Tech Tips on our website (www.rv-partsplus.com) under the Resources Tab. This is the 48th Tech Tip article I have written and all of them are posted on the website for you to access free of charge. Many of the early articles were written after an owner approached us with a problem and together we worked through the solution. I have broadened the scope of these articles based on my experience in assisting RVers. The index page gives you the main topic of the article and you are free to use them however if they are reprinted in any form we ask for full credit since they are copyrighted material. If you attend a number of Bounder, FMCA or other Coach brand Rallies, we give seminars using PowerPoint slide presentations that are always very well attended. These seminars or workshops are designed to give you a lot of information in a very practical fashion so that you can immediately apply the hints and suggestions to your RV. If you have the opportunity to attend, you will learn a lot in a short period of time. The other information source that I recommend to RVers, no matter what brand of coach they own, is the Web Page:http://groups.yahoo.com/group/bounder .You can send an email to Bounder@yahoogroup.com and request to join the user 'E'-group. For those interested in diesel coaches try this web page: http://groups.yahoo.com/group/bounder_diesel and you can send an email toBounder_diesel@yahoogroup.com to join. (Notice the underscore between Bounder and Diesel). Once you have access, you can search by topic and read on the website the postings of past users. You can also post a question and many RVers with a lot of practical experience will respond. You may get some diversity in opinions and responses however if someone has input you will receive a response. I have witnessed situations being posted on the site where a response was needed quickly and within minutes someone replied with the solution that corrected the problem. When you have a large group of owners, such as the Bounder Group, someone will be online when you post a question and from that vast resource network, someone will have an answer to your question.